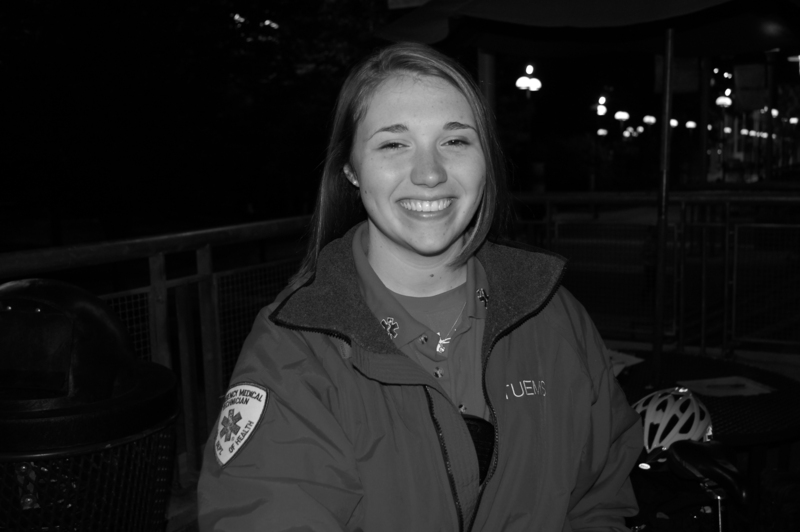 Laura Anastor has been working as an emergency medical technician since her junior year of high school in Vineland, N.J. Now, she’s loving Philadelphia’s jazz music and preparing for medical school, where she plans to go after her graduation in May 2010. The Temple News: How’d you end up at Temple? Laura Anastor: I decided to come to Temple because of the area, because of Philly. I really wanted to be close to hospitals, so I decided to come here in hopes to go to Temple Med, but I don’t know if that’s going to happen. I might end up at Drexel Med. TTN: How’d you end up becoming an EMT? LA: I actually was an EMT in high school when I was a junior, in the spring of my junior year of high school, and then I started riding as a volunteer. When I came here to Temple, I didn’t know about this because it hadn’t really existed before. Fall of 2006, we became a student organization. We didn’t even have the bikes. It was still in the works. Then, through the American Medical Student Association, I found out about Zach [Reichenback, founder and supervisor of Temple University Emergency Medical Services] and his plan to undertake this whole thing, so I started with him and transferred my reciprocity over to PA.
TTN: So, you’ve been with TUEMS since the beginning? LA: Right, yeah. Technically, we were operational Spring of ‘08. TTN: OK, so you’ve been doing this a while. You must really like being a part of TUEMS. LA: I do. It’s fun. It’s a good networking thing with the cops too. It’s nice to have them on our side, and they think advocating for students is good, too, because they don’t know all the time that we’re students and that we’re trying to help them. TTN: What kind of stuff do you see as an EMT? LA: We see a lot of everything, which is good, and I didn’t expect that. We have everything from respiratory emergencies to [pedestrian-motor vehicle accidents] to sports traumas. We just came from two guys that crashed on the rugby field, stuff like that and your occasional intoxication. It’s been a good experience. I’ve had EMT experience outside of this, but I was surprised by how much stuff we got to do with the cops, and people like having us around. TTN: What do you do outside of being an EMT? LA: I do yoga, and I paint. I work at home as an EMT too. I do painting and things like that, enjoying Philly, going to listen to music, jazz, in the city. I love jazz, love jazz. TTN: Are there any common mistakes you run into with students? LA: They always think we’re cops. It’s always like, “Who are you?” That’s why we try to ride around and be visible when we are on duty because they don’t know who we are, and we might have to help them in some situation. We’re students just like them. TTN: OK, here’s the last question, which is always an important one: If you could have any superpower in the world, what would it be, and why? LA: I don’t know. This is throwing me off.